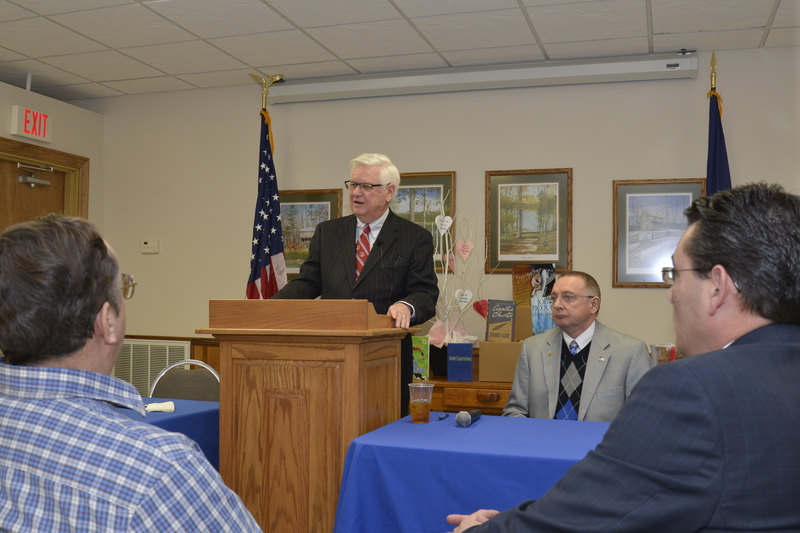 MONTICELLO, Ky -- Today, U.S. Rep. Harold "Hal" Rogers (KY-05) was the keynote speaker at the Wayne County Chamber of Commerce's monthly meeting at the Wayne County Extension Office. Before his keynote address, Citizens National Bank announced a new $1,000 scholarship opportunity for Wayne County High School students. As an alumni of the school, the bank honored Rogers by naming it the "Congressman Harold Rogers Scholarship." "This scholarship is a wonderful gift for Wayne County High School students, and I'm so honored to be a part of this generous college opportunity for our students," said Rogers. "College changed my life, guiding my interest in the field of law and public service. We can only hope that scholarships like this help launch our future leaders on their journey to success." In his keynote address, Rogers commended the 200-plus men and women representing the Kentucky National Guard's C Battery 1/623rd Field Artillery unit based in Monticello that returned home in October after serving nearly a year in Jordan. It was the first Kentucky National Guard Unit to ever be deployed to Jordan. The Monticello Artillery was Rogers' home unit as a former member of the Guard. Just returning from Washington, D.C. this week, Rogers shared his optimism for bipartisanship in Congress, in light of the overwhelming passage of the Bipartisan Budget Act of 2013. The omnibus package provides the federal government with a budget for the first time in years. Here at home, Rogers said Wayne County will benefit from the new SOAR initiative: 'Shaping Our Appalachian Region' that he and Governor Steve Beshear launched late last year. In concert with SOAR, U.S. Department of Agriculture Secretary Tom Vilsack announced the StrikeForce program is expanding to Kentucky and will cover Wayne County. Rogers also said phase one of a new high-speed, high-capacity broadband project will soon be launching in southern and eastern Kentucky. "Kentucky's Super I-way will take away our historic barriers to better jobs. All of a sudden, the world is flat and the famed superior work ethic of our people will be able to compete with the world," said Rogers. Before leaving, Rogers also delivered about one hundred books for the Wayne County Public Library to Director Anne Garner. "Since the Library of Congress is the largest library in the world, it receives duplicate copies of books that can be donated to other libraries in need," said Rogers. "So, this is a simple way to help our public libraries stock their shelves and replace older books during tough economic times."